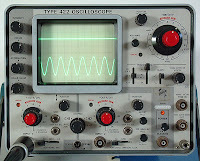 The New Jersey Antique Radio Club held an Oscilloscope School in March, 2011. The club recorded this excellent 2 hr 21 minute program and provided an on-line textbook. This is a first rate presentation regarding oscilloscopes and we highly recommend it to anyone interested in this versatile piece of test equipment.